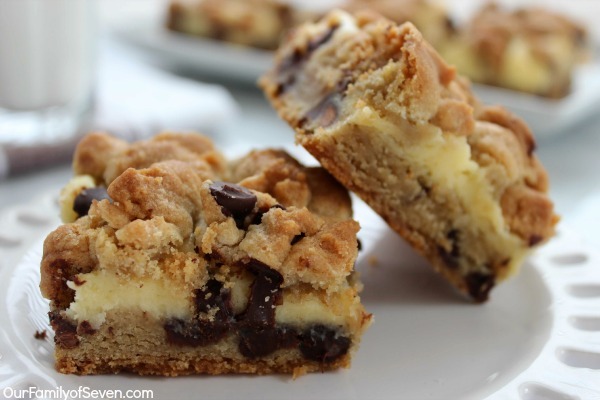 These Chocolate Chip Cookie Cheesecake Bars combine the favorite flavors of chocolate chip cookie and cheesecake all in one fabulous dessert. When I ask my gang what they would like for dessert, I consistently hear the same answer from each and everyone of them…Chocolate Chip Cookies. I really like Chocolate Chip cookies but, not as often as they all seem to like them. Last week, Cierra and I were trying to think of a spin to put on a traditional chocolate chip cookie. Both of us are big cheesecake fans so we both, at the very same time, came up with Chocolate Chip Cookie Cheesecake Bars. Luckily we had everything on hand so no costly trip to the grocery store was necessary. 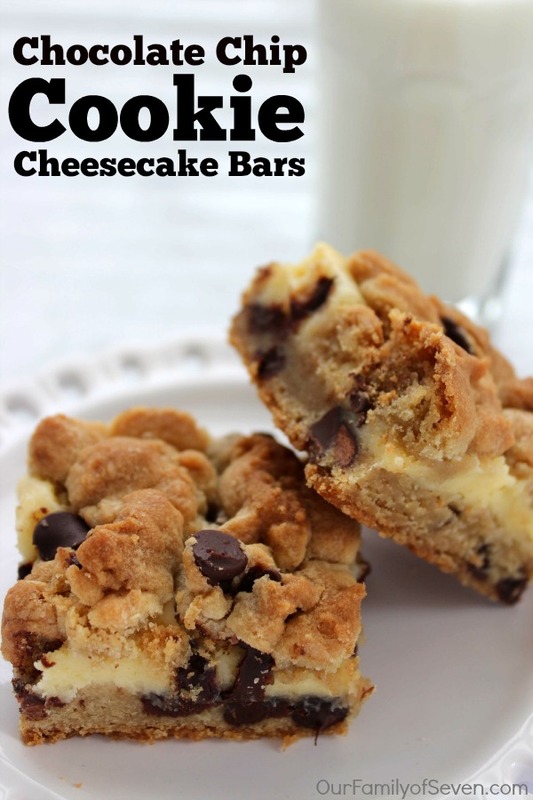 The thought of soft chocolate chip cookies with cheesecake in a bar form sounded perfect! 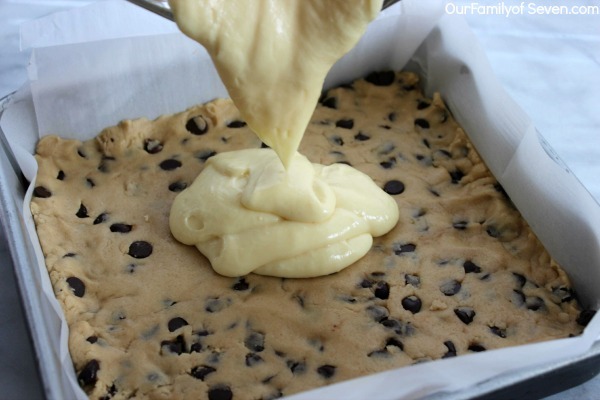 We took a break from working on a craft project and whipped up a batch of cookie dough as our cream cheese softened. Our bars came together in very little time. We both admitted it was difficult to get back at our crafting. The smell from the kitchen was just a bit distracting, ha ha. 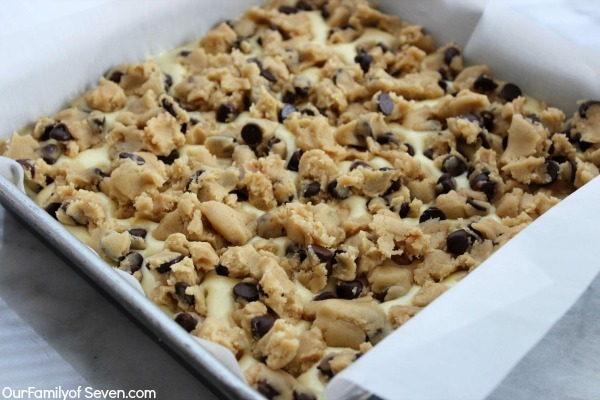 Line a 9×9-inch square baking pan with parchment paper or aluminum foil and spray with nonstick spray. 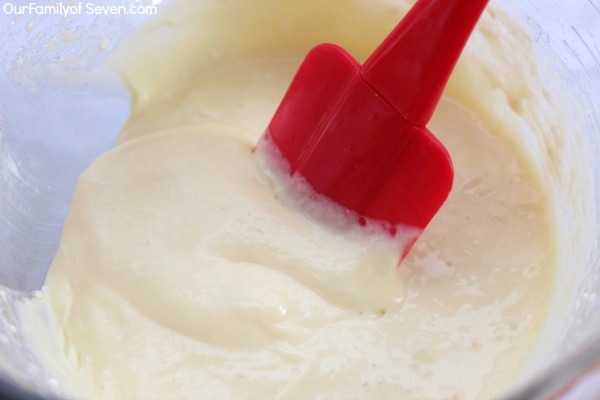 Whisk together flour, baking soda and salt for crust. Cream together butter, brown sugar and sugar until fluffy. 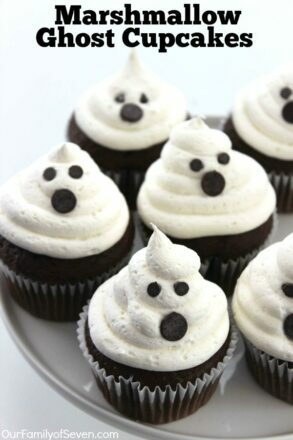 Add egg and vanilla and whip to incorporate. Add flour mixture and mix until incorporated. Press 2/3 of the mixture into the bottom of the prepared pan to form an even layer. Combine filling ingredients and beat until blended. Spread filling over the cookie dough layer and level. Crumble remaining crust dough over the filling layer. 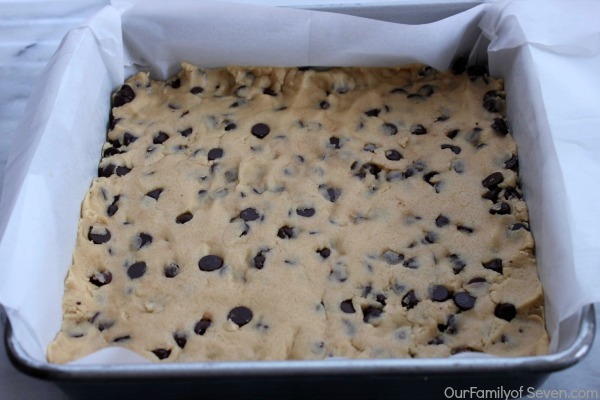 Bake for 40 minutes, or until cheesecake is set and cookie dough has browned. Allow to cool completely and chill before slicing. 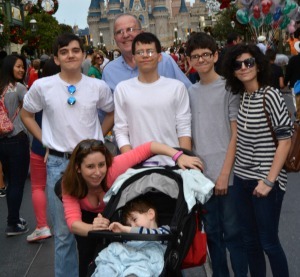 We planned to wait on eating until the boys arrived home from school, but we just could not hold out that long. After finishing up our lunch, we grabbed a glass of milk to share and then devoured a bar each. These bars were perfect. One bar was plenty enough for me, they were definitely filling. The boys all enjoyed a bar when they arrived and all of them agreed that they were “Super Tasty”. The baby refused of course, he eats NOTHING sweet at all. That boy just doesn’t know what he is missing. 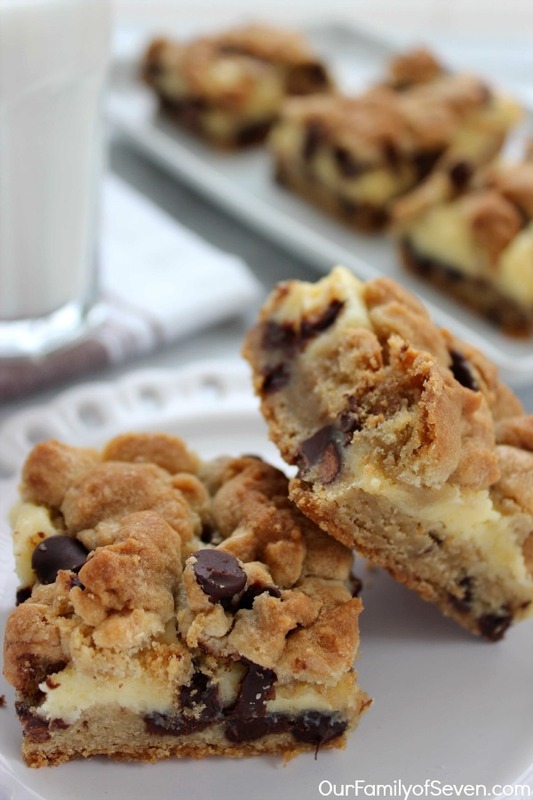 These Chocolate Chip Cookie Cheesecake Bars would be great for sharing at any potluck. 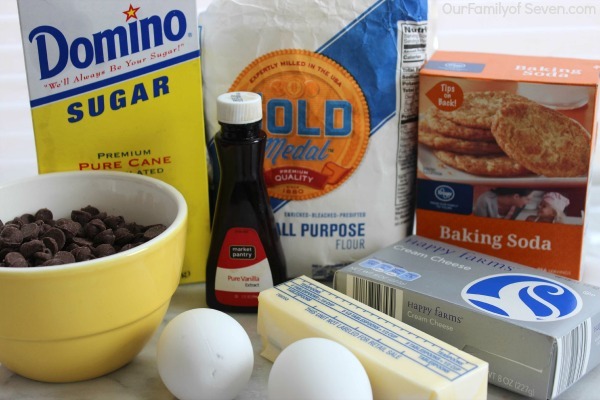 Since chocolate chip cookies seem to be a favorite with most everyone, they are sure to disappear quite quickly. We will quite often purchase store bought chocolate chip cookie dough in a tub. 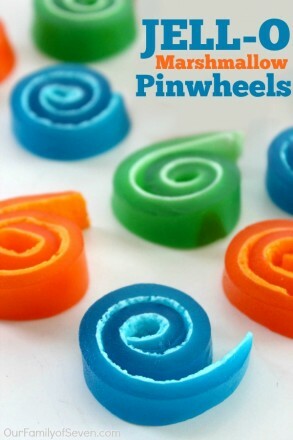 They are so convenient for making a quick evening dessert. Mike and the kids will throw in a quick and easy batch. 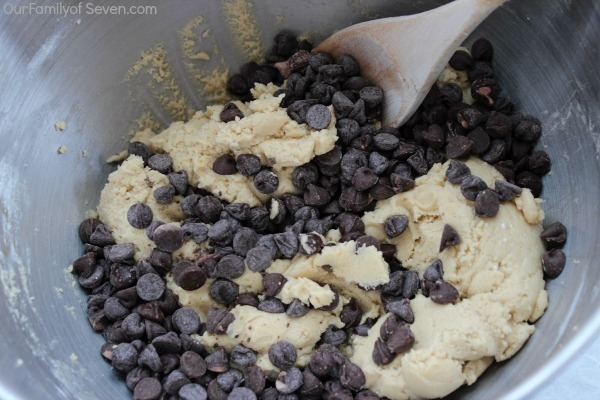 Do you make your chocolate chip cookies from scratch, buy packaged cookies or store bought cookie dough? I would love to know what all your families prefer. Line a 9x9-inch square baking pan with parchment paper or aluminum foil and spray with nonstick spray.